I can't say that I was particularly enthusiastic about the prospect of owning a sewing machine. 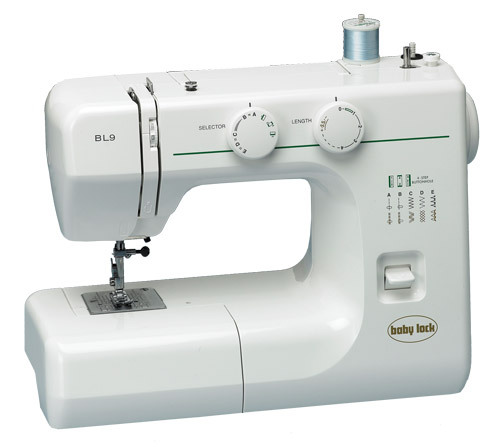 I don't have very fond memories of sewing machines. My only real experience using one was back in junior high during home economics class. Students were assigned to make decorative throw pillows. And what horrible little pillows we all made. Although I have managed to successfully block much of my junior-high experience from memory, I do recall two lessons I learned in home economics: (1) don't burn your eyes with steam and (2) sewing machines jam...often. Coincidentally, Eric and I attended the same junior high and have the exact same takeaways from home economics--steam in eyes is bad and sewing machines are finicky. While both Eric and I are extremely cautious when removing the lid from a pot of boiling water, only one of us (Eric) was interested in testing our luck with a sewing machine (I assume Eric's pillow turned out better than mine). Although I was not inclined to buy a sewing machine, I am truly excited by the idea of being able to produce as many (horrible) little pillows my heart desires. Before I fulfill that fantasy, however, we have a few small boat-related projects in mind for the near future (more on that later).